I love zucchini. I make it all the time and these boats are worth the little extra prep required. They don’t really freeze well. So if you need, cut the recipe in half. Enjoy! 2) Scoop out the center of the zucchini halves with a spoon. Save the inside and chop them into small pieces. Set aside the zucchini shells. 3) Coat a large skillet with oil spray and warm over medium-high heat. Add the carrot, bell pepper, chopped zucchini centers and tomatoes. Cook for about 5 minutes, stirring occasionally, until the veggies become soft. 4) Add the chicken pieces to the skillet and cook until they are no longer pink. Stir in the chives, paprika, oregano, and red pepper flakes and salt. 5) Place the zucchini boats open side up on a baking sheet. 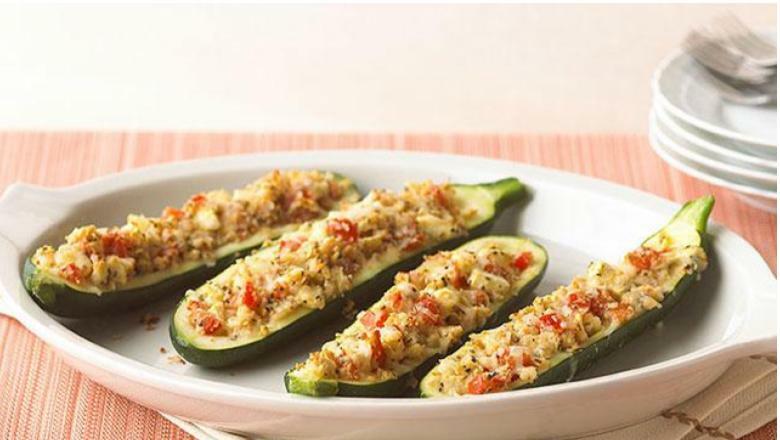 Spoon the chicken vegetable mixture evenly into each zucchini boat, bake for 30 minutes on the middle rack. 6) While the boats bake, prepare the topping: combine all the ingredients a small bowl.